Automatic Transfer Switches are integral components of both standby and emergency power systems. They offer a condensed, reliable, and flexible assembly for transferring crucial loads and distribution systems from one power source to another. Transfer switches create a simple, streamlined power management system within a data center or manufacturing facility. 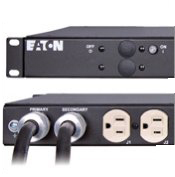 Eaton’s Automatic Transfer Switches are perfect for a wide range of mission critical applications.